As a humanitarian aid worker, I have always had conflicting wishes. On the one hand, I hope to save more lives, but on the other hand I pray the world no longer need aid workers, there are no more wars or natural disasters. Unfortunately, the global demand for humanitarian relief work is only growing. Unlike the last few missions where I felt excitement, in this mission, my fifth for Médecins Sans Frontières (MSF) carrying out humanitarian relief work, I felt much calmer. In the face of increasing attacks on humanitarian organisations globally, the biggest challenge I faced before my departure to the mission, was to get my parents’ support. Fortunately, I have two sisters who helped influence and convince my parents until they silently supported me. What matters to me most, is my family’s support. It is true that MSF has always put the safety of humanitarian workers first. We have comprehensive security guidelines that field workers have to follow strictly. We regularly communicate with parties from all sides of the conflict to have their respect our medical facilities and our principle of neutrality. Everything is meticulous arranged. However, there are still malicious attacks that happen occasionally. We understand it’s a very difficult task to prevent every single attack, so what we do is to continue to let the world know about our work, to understand our independence, neutrality and impartiality, and hope the world respects humanitarian relief work. Behind every life that I have saved, there is always a story that has touched my heart. It has always been the source of motivation for my commitment to the humanitarian relief effort. One of the stories is about Akok, a young and promising South Sudanese teacher with lots of potential. Akok’s right leg developed a lump about a year ago. He has had consultation and treatment from a few local doctors. All of the local doctors said it was an abscess and gave him only pain killers and wound dressing without further investigating the root cause. Unfortunately, a year later, the lump grew to the size of a football, not only causing pain and constant bleeding, but made walking extremely difficult. Then Akok came to our hospital in Bor. Although we didn’t have the ability to do histology tests, and had no X-ray or imaging, by virtue of my clinical experience, I was certain that Akok’s problem was a malignant tumor, and amputation was the only treatment option. Akok and his family were shocked, and Akok, in realizing how severe his condition was, he couldn’t help but shed tears. 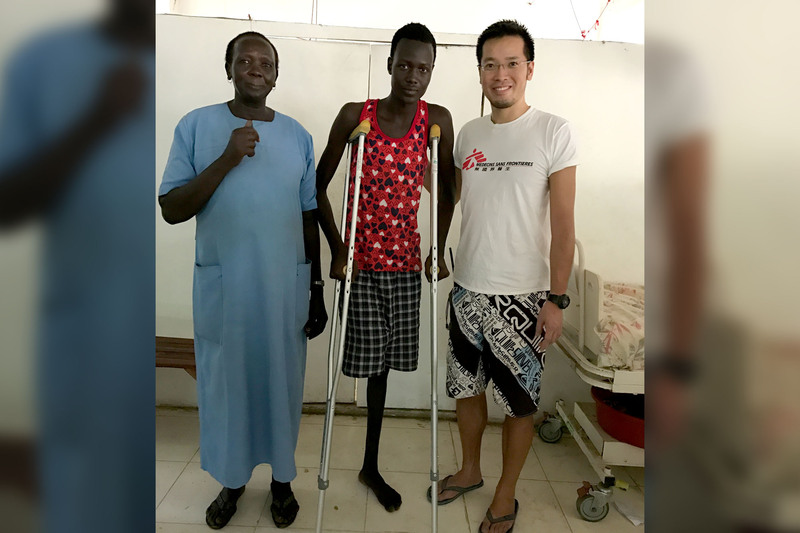 After Akok and his family digested this devastating news, I encouraged them by informing them that after surgery, Akok will be able to walk with the aid of crutches, or could even be fitted with prostheses so he can walk again like a normal person. Therefore, Akok chose to have the surgery. The surgery lasted for less than an hour. Akok's right leg, from above the knee, together with the tumor was removed. During surgery, given that a spinal anesthesia was administered to Akok, he could hear everything, including the most distressing sound of amputation, the sawing of bones. So I played music from my phone to cover the disturbing noise and to minimize the subsequent negative psychological impact of the surgery on him. After surgery, Akok woke up and saw his legs bandaged. He was surprisingly calm and I could see a sign of relieve on his face. I was also relieved. Since the day of surgery, there has always been a smile on Akok’s face, no trace of resentment over the situation, nor blame for anyone. It is absolutely admirable for someone to have this optimistic attitude in life. I can’t help thinking, if it were me, could I be so calm? With our post-operative care, Akok has recovered very well and is now able to walk with crutches. Watching this, it’s more rewarding than any material return. It’s what motivates me to continue to support MSF missions. Wishing Akok is doing fine now. Respect his optimistic attitude despite all the circumstances. May his optimistic spirit and smile shines in the dark. Akok, you looking so good!